Homemade sports drink with …vinegar? You are here: Home / Remedies / Homemade sports drink with …vinegar? 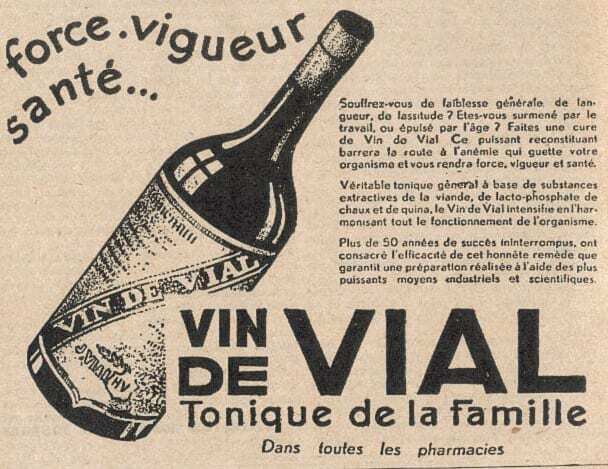 Apple Cider Vinegar is one of those vintage ingredients (like cod liver oil, yum.) that crops up again and again in my reading. I’ve never used it much myself though, mainly because it smells so… vinegary! I do love white vinegar for household use, and syrupy dark balsamic vinegar for eating, but cider vinegar I had relegated to the back of my cabinet. Until recently. Googling “apple cider vinegar” uncovers a ton of sites dedicated to this ‘miracle’ ingredient. I’m always skeptical about crazy health claims (remember the claims about Queen of Hungary Water??) However, when I came across a reference to making a Gatorade-type sports drink using apple cider vinegar, honey and a pinch of salt, I thought I’d give it a try. I bought a nice bottle of organic apple cider vinegar (ACV). On the label it states that you can take a teaspoon of ACV in water every morning as a general health tonic. I stirred up the ACV, honey (a large heaping teaspoon, I admit) and a pinch of salt in a glass of water. Braced myself, and took a sip. Actually, it didn’t taste like vinegar at all! It tasted quite nice. Slight apple/honey taste. Amazing! 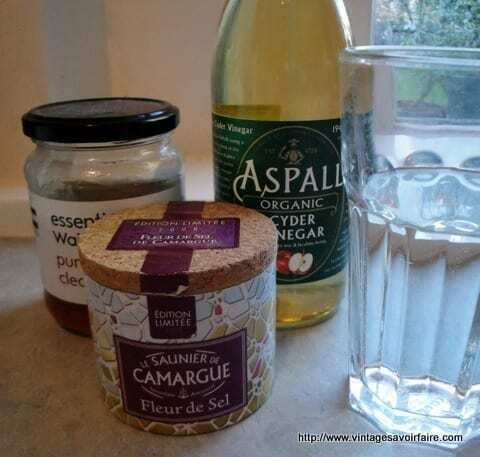 This homemade drink is supposed to be restorative and nourishing to the body – could be good to use after a workout, gardening etc… but also was traditionally used during ‘convalescense’ (another antiquated concept – convalescing is the brilliant concept of actually RESTING after an illness to help your body heal itself). The tastiness of this drink also got me thinking about infusing ACV with some fresh herbs like sage or thyme, and drinking it in the winter during cold/flu season. Stir ingredients into an 8oz glass of water until honey is dissolved, then drink. Feeling brave enough to try this? If you do, let us know in the comments. Previous Post: « Shiny, bouncy hair without shampoo! Theoretically. The benefits of acv are magnified if you use raw vinegar instead of pasteurised as it is also a probiotic. Braggs do one and it is also easy to make at home. Hay Makers Switzel – that’s what it is. Very old recipe for people working in hot conditions. I have used it during civil war reenactments and can put an over heated and dehydrated soldier on his feet in minutes. Recipe is 1 gallon of boiled water – warm, 1 cup honey, 1 cup apple cider vinegar. I add 2 Tablespoons of grated ginger. The ginger calms the digestive system and prevents nausea, plus adding flavor. The vinegar has the electrolytes , honey is a simple sugar which is easily adsorbed in the stomach and provides energy. It does not pull water out of the system into the intestines to digest which cane/beet/corn sugar does. (Ever wonder why you get diarrhea after being overheated and dehydrated). And of course boiled water which was very important before today’s sanitary water resources. Gateraide is highly overrated!! @Sandy, so glad to hear you use it too – this stuff really works! My mom’s cure-all for thirst was ACV in water (no honey). We grew up thinking it was good, so it was! Still love it! Apple juice and vinegar can also make a great homemade sports drink. My recipe for an apple juice and vinegar sports drink tastes better and costs less than the commercial sports drinks that contain empty calories and chemical additives. I love Bragg’s cider vinegar and the newish apple cider/honey drink they make. But, I found the bottle drink a bit too sweet when I was looking to quench my thirst after a really rigorous workout. I tried this recipe this morning, after exercising, and it was awesome! Delicious, super thirst-quenching and very restorative. Thanks so much for posting this recipe! I will try this! Sometimes I drink apple cider vinegar in a glass of water to settle my stomach. It seems to work quite well. I made the Queen of Hungary water over the summer. While it seems to make my acne a little less red, I cannot attest to it curing asthma or straightening curvatures of the spine. Very cool you made the queen of hungary water too. I’m not convinced about it’s miracle-working properties either, but I did like it a lot as a face toner!